Two clowns reimagine entertainment through micro-amusement parks. They use technology, a bit of showmanship, and a unique process of innovation to develop their immersive social games. What does the circus have to do with manufacturing? Well, the founders of Two Bit Circus are planning to build micro-amusements around the world. To do so, they’re learning how to go from prototype to production on their unique games. They’re about to open their first park in DTLA this summer, so I wanted a sneak peek at the new games and experiences they have in store. In the process we learn about their process of developing their crazy ideas. We talk about tinkering, iteration, scale, immersive experiences, and social gaming. Brent and Eric bring unique backgrounds to the company. Brent once ran a web hosting company and an automotive salvage business. He’s also the son of Nolan Bushnell, the founder of Atari and Chuck E Cheese. Eric is the Mad Inventor and makes others see technology as magic. He has a colorful history as a circus performer, professional whistler & roboticist. Brent Bushnell is the CEO and co-founder of Two Bit Circus, a Los Angeles-based experiential entertainment company. The interdisciplinary team strives to create immersive, social fun and is currently building a network of micro-amusement parks featuring free-roaming VR, robot bartenders, an interactive supper club and more. Previously they launched STEAM Carnival, a traveling showcase of high-tech entertainment and student STEAM workshops. They’ve captured action sports content in 360 video for brands like the NFL, NBA, Indy and the Olympics for use in VR activations at the Super Bowl, All Star games and in retail. The company regularly serves as immersive entertainment partners for brands and location-based facilities. Previously, Brent was the on-camera inventor for the ABC TV show Extreme Makeover: Home Edition. He was a founding member of Syyn Labs, a creative collective creating stunts for brands like Google and Disney and helped OK Go build the Rube Goldberg machine for their viral This Too Shall Pass music video that garnered 50+ million views on YouTube. Brent is board president of the Two Bit Circus Foundation, a 501(c)(3), that deploys STEAM-based programs to inspire students about invention and operates annual STEAM Carnivals bringing the excitement of STEM & STEAM to communities around the world. He’s a Sir Edmund Hillary Fellow and enjoys mentoring teens in entrepreneurship via programs such as NFTE. He’s a supporter of Clowns Without Borders and publishes on Twitter @brentbushnell. 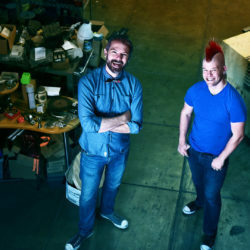 Eric Gradman is Mad Inventor and co-founder of Two Bit Circus and STEAM Carnival. He makes others see technology as magic. He has a colorful history as a circus performer, professional whistler & roboticist. For 15 years he has designed and built cutting-edge technology products including 3d-touch displays, virtual reality systems, satellite control systems, intelligent robots, concept cars, assistive devices, and crazy games that will blow your mind. He is at the forefront of a revolution in personal manufacturing tools that make inventing accessible to all. He is cofounder of Two Bit Circus: a Los Angeles idea factory making entertainment more enriching and education more fun. He is one of the brains behind the STEAM Carnival, reimaginging the carnival with robots, lasers, and fire. Eric is on television: as an on-screen inventor for ABC’s Extreme Makeover Home Edition, a talking head for Outrageous Acts of Science (Discovery Science), and as a special guest on several shows including Invention: USA (History), and The NEXT List (CNN). His interactive artwork has been exhibited at LACMA, Sundance Film Festival, The Leonardo, Mindshare.LA and the TED Conference.